Over the past two decades, we've been bombarded with Spider-Man movies. There have been three different reboots for the character, two from Sony and one from Marvel. While there were a lot of fantastic movies in there, there were also some terrible ones that should never have been made. You'd think we'd be burnt out by Spider-Man movies by now, but Spider-Man: Into the Spider-Verse proves otherwise. The animated film directed by Bob Persichetti, Peter Ramsey and Rodney Rothman turns things on their head with two major twists. First, it's an animated movie as opposed to the live action Spider-Man movies we've seen over the past decade, and second, it focuses on Miles Morales, not Peter Parker. 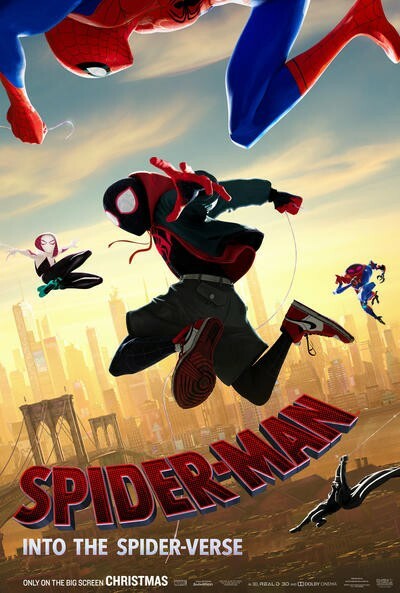 Miles is a half-African American, half-Puerto Rican teenager living in Brooklyn, New York where he is bitten by a radioactive spider. That story should sound pretty familiar to you. What shouldn't is that there isn't one Spider-Man in the movie, but six. They consist of Miles, Peter Parker, Spider-Gwen, Spider-Man Noir, Spider-Ham and Peni Parker. This unique wrinkle adds a dimension to Into the Spider-Verse no previous Spider-Man movie can claim. And in a big surprise, it also gives it its emotional depth. The five additional Spider-people become Miles' defacto mentors as he figures out what it means to be Spider-Man and masters his newfound powers, which include the ability to become invisible. The Miles-Peter Parker relationship in particular strikes a genuine warmth that explores a new side of Peter we've never seen before while peeling the layers of what makes Miles the right person to take up the mantle of Spider-Man. This juxtaposes brilliantly with the cast of villains that will make any Spider-Man fan proud. Kingpin, Green Goblin, Doctor Octopus, Scorpion, Tombstone and Prowler all make appearances. Into the Spider-Verse finds its footing in the animation world with a blend of 2D and 3D interspersed with frames that resemble the comic book visual language. This creates a striking finish that is visually impressive, but also pushes the envelope with what Spider-Man can do. Some of the scenes of Spider-Man swinging through New York will leave you awed. One such scene is when Miles jumps off a high rise and the inverted shot delivers an instant classic of cinematography. Much of the heart in Into the Spider-Verse is delivered by the strong voice cast. It's a who's who of Hollywood talent, including Shameik Moore, Jake Johnson, Hailee Steinfeld, Nicolas Cage, Kathryn Hahn, Mahershala Ali and Liev Schreiber. Moore specifically conveys the dynamic personality of Miles that goes from timidness and fear to courage and confidence as the movie progresses. Spider-Man: Into the Spider-Verse just came out this month and if you haven't seen it, I highly recommend it. It's a fantastic time that delivers on the wonder and spectacle Spider-Man is known for. For more Spider-Man news, check out our sister sites SpidermanNews.com and TheNerdy.com.